"In this room, you couldn't buy your win, you couldn't buy me, and you couldn't buy a seat at the table." STX Entertainment has debuted the second trailer for Molly's Game, the directorial debut of screenwriter Aaron Sorkin. Sorkin directs from his own script telling the true story of a woman named Molly Bloom, adapted from her memoir. 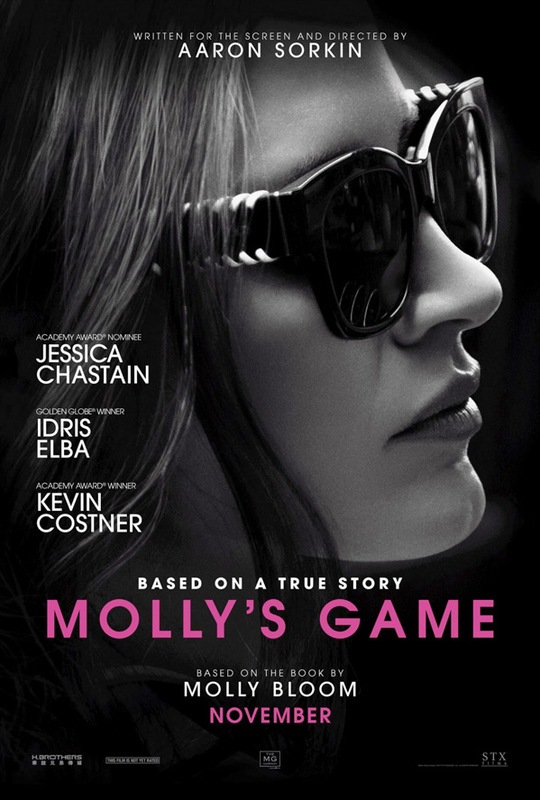 Jessica Chastain plays Molly, a young Olympic-class skier from Colorado who ran the world's most exclusive high-stakes poker game for a decade before being arrested in the middle of the night by 17 FBI agents. This also stars Idris Elba, Chris O'Dowd, Kevin Costner, Michael Cera, Natalie Krill, Joe Keery, Bill Camp, and plenty of others. This is a very lively, captivating trailer that will definitely make you want to see this film. Along with great reviews from TIFF, I'm ready to see this now. You can still watch the first trailer for Aaron Sorkin's Molly's Game here, to see even more footage. The true story of an Olympic-class skier named Molly Bloom (Jessica Chastain) who ran the world's most exclusive high-stakes poker game and became an FBI target. Her players included movie stars, business titans and unbeknownst to her, the Russian mob. Molly's Game is written and directed by screenwriter-turned-filmmaker Aaron Sorkin, making his directorial debut. Sorkin wrote the scripts for A Few Good Men, Charlie Wilson's War, The Social Network, Moneyball, Steve Jobs, and wrote the screenplay for this. Adapted from Molly Bloom's memoir of the same name. STX Entertainment releases Sorkin's Molly's Game in theaters starting December 25th limited on Christmas Day, then wide in early January. Your thoughts?